As the world of marketing gets more and more cluttered every day, it's forcing advertisers to get creative. From urinals and sheep to foreheads and armpits, welcome to the world of wacky ad spaces. Every year, the New York International Auto Show is held at the Javits Convention Centre in New York. It is one of the largest auto shows in North America and has been running annually since the year 1900. At that show recently, Audi wanted to promote its new A4 model to the one million people who attend the event. But the car maker wanted a surprising way to reach those potential car buyers and it came up with this unexpected idea. As you may know, it's often hard to get a signal on your smartphone when you are in big convention centres. Too much interference means zero bars on your phone. So car shows usually provide visitors with a free Wi-Fi network they can jump onto while there. That's where Audi saw an opportunity. It offered to sponsor the Wi-Fi. 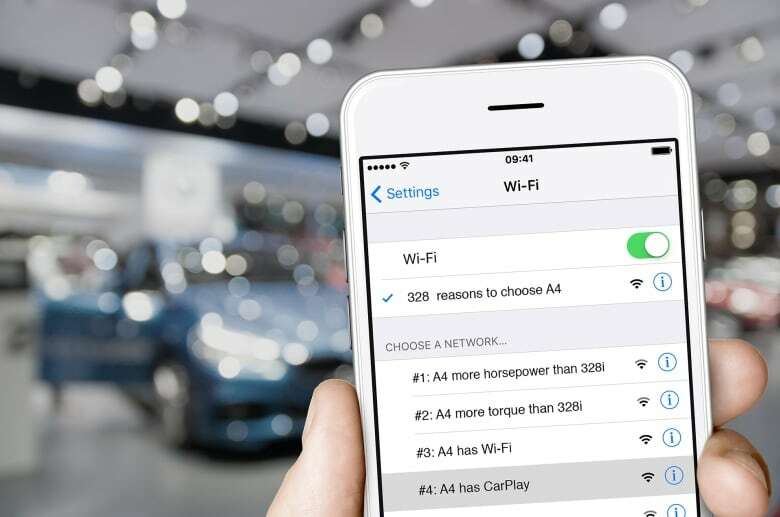 So when people went to their smartphone settings to log onto the Wi-Fi, they saw that the auto show Wi-Fi was named "328 Reasons to choose A4." Then you could choose a network from dozens of options – each labeled with a feature of the A4. The name of Wi-Fi network #1 was: "A4 has more horsepower than 328i." 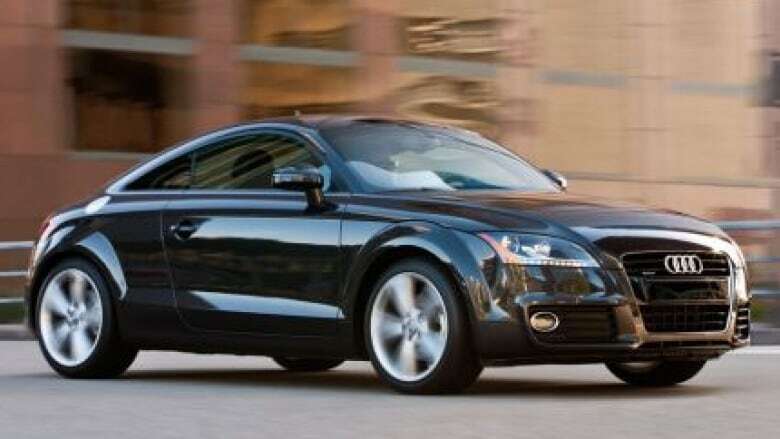 The name of Wi-Fi Network #2 was: "A4 more torque than 328i"
Both were direct shots at competitor BMW. Another network was called "A4 has CarPlay." Every time car shoppers logged on to the car show Wi-Fi, they were given yet another reason to buy an Audi A4. And over the course of the three-day event, they saw 328 reasons in total. And - imagine for a moment if you were a competitor of Audi and you had to log onto that Wi-Fi network every day of the car show. Imagine if you were BMW. Sponsoring the Wi-Fi: such an unexpected marketing idea. Not long ago, British travel booking site "TheTrainLine.com" was looking for a way to promote their business. The company claims to save passengers an average of 43 per cent on rail tickets. The majority of travelers buy their tickets at the station - so their best strategy was to shepherd existing passengers over to their site. To do that, they partnered up with an ad agency and came up with an unorthodox strategy. Their idea was to advertise on sheep. Ewes, to be specific. Many train trips in the U.K. involve long stretches of countryside. And passing herds of grazing sheep along the way comes with the territory. So TheTrainLine.com launched the first "Lambient Advertising Campaign" by putting branded ponchos onto sheep along one train line to Gatwick Airport. The ponchos read: "TheTrainLine.com. 43 per cent." The accompanying TV and billboard campaign featured 40 sheep trained to step in and out of trains and even read newspapers. The idea got TheTrainLine.com a lot of free publicity. And it got the sheep a lot of attention. As one farmer who loaned his sheep for the ads said: "I just hope my ewes don't start turning into divas." Kentucky ad agency Cornett first coined the term "beardvertising" in 2013. As 55 per cent of men have facial hair, Cornett saw an opportunity. They created "beardboards" – tiny business card-sized ads that clip straight onto your beard. Willing gentlemen are paid $5 a day to sport the tiny billboards for brands like A&W and Dollar Shave Club. Business Insider called it "half-joke, half-genius." Either way, it's a fascinating new strand of marketing. In the last few years, food companies have begun selling space on their fruit and vegetables. Fruit stickers. Small advertisement, big idea. (Amy Sancetta/Associated Press) Back in 2015, Universal Pictures came out with its latest film, Minions - an animated spin-off of the Despicable Me franchise about tiny, yellow creatures called Minions. 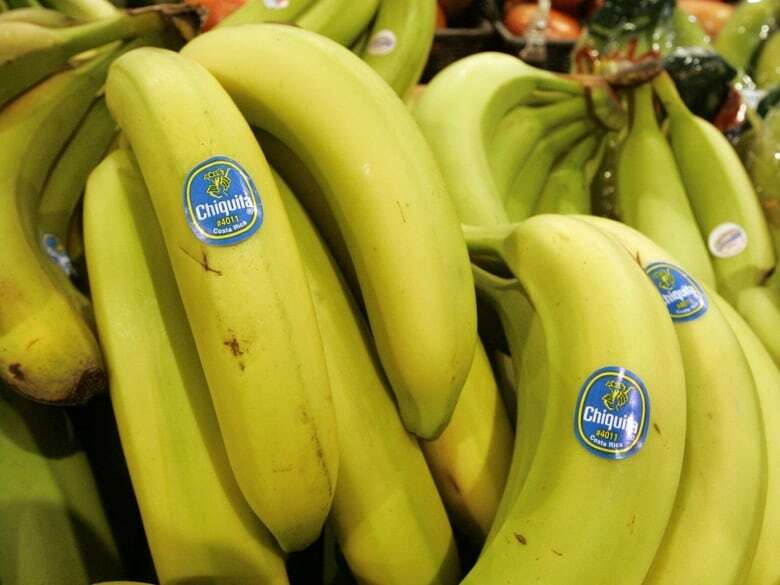 To market the movie, Universal made an unexpected partnership with Chiquita Bananas. More specifically, Chiquita Banana fruit stickers. Fruit stickers have been around since the 1990's - created with the sole purpose of expediting the checkout process. Each individual fruit has its own sticker containing a price look-up code for easy scanning. While most of us simply see them as something to peel off before taking a bite, Universal saw an opportunity: to create Minion-themed fruit stickers. The partnership made sense, as minions are yellow and one of the main character's favourite words is "banana." Each sticker would feature a different Minions character. Customers could download the Chiquita FanFun app and scan one of the 32 different stickers for instant access to games, prizes and even Minion-themed banana recipes. Minions took home over $1 billion dollars at the box office with many thanks…to bananas.